Since peaking at over 67m in the late 1990s, Japan’s workforce has shrunk by about 2m. The government says it could collapse to 42m by mid-century as the population ages and shrinks. The number of foreigners inched up in 2015 to a record high of 2.2m, but that is far from enough to fill the labour gap. Instead of opening its doors wider to immigrants, Japan is trying to make more use of its own people who are capable of working. Large companies in Japan mostly set a mandatory retirement age of 60 – mainly as a way of reducing payroll costs in a system that rewards seniority. But other businesses are less stringent. About 12.6m Japanese aged 60 or older now opt to keep working, up from 8.7m in 2000. Two-thirds of Japan’s over-65s say they want to stay gainfully employed, according to a government survey. The age of actual retirement for men in Japan is now close to 70, says the OECD, a rich-country think-tank. In most countries people typically stop working before the age at which they qualify for a state pension. Japan, where the state pension kicks in at 61 (it is due to rise to 65 by 2025), is a rare exception. The greying of Japan’s workforce is clearly visible. Elderly people are increasingly seen driving taxis, serving in supermarkets and even guarding banks. Bosses are getting older, too. Mikio Sasaki, the chairman of Mitsubishi Corporation, a trading company, is 79. Masamoto Yashiro, the chairman and CEO of Shinsei Bank, is 87. Tsuneo Watanabe, editor-in-chief of the world’s biggest-circulation newspaper, the Yomiuri Shimbun, is a sprightly 90. It is inevitable that people will stay in the workforce longer, says Ken Ogata, the president of Koreisha, an agency that provides temporary jobs exclusively to people over 60. He notes that the country has little appetite for importing workers, so it will have to make more use of pensioners, women and robots. Many of those who find work through Koreisha were once employees of Tokyo Gas, Japan’s largest supplier of natural gas to homes. They do the same kind of work now—reading meters and explaining the use of appliances to homeowners. “They have so much experience and knowledge that can be put to good use,” says Mr Ogata. They can also be cheaper. Companies often hire back retirees on non-permanent contracts offering poorer terms than their previous ones. Takashimaya, a department-store chain, has introduced a performance-based system for such employees aged 60-65 (at no extra cost to the company, it says). At Nishijimax, managers clearly want elderly workers to stay. The company’s work routine is tailored to their needs. So, too, are the canteen’s offerings—right down to the reduced-salt miso soup. Economists say if Japan wants to alleviate its worsening labor shortage, it needs a whole lot more people like Suzuki, who is atypical by working into his 70s. Though it boasts the world’s oldest population, Japan does an inadequate job of employing healthy seniors, they say. The reasons: company policies, work culture and a history of rigid seniority rules that work against older employees, providing a cautionary tale to aging economies, including those in Europe and the U.S.
Suzuki is part of the largest group of people aged 65 or older in the world; numbering more than 33 million, they represent more than a quarter of Japan’s population. With the world’s longest life expectancy — by 2050 women in the country on average will live past 90 — and a low birthrate, the working-age population is shrinking. 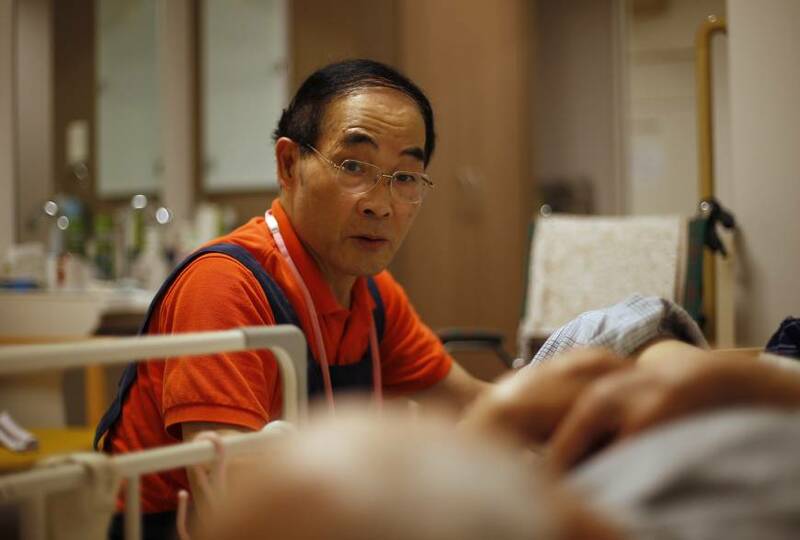 Japan’s demographic reality is so extreme that even though it has the highest proportion of working seniors among developed countries, according to the Organisation for Economic Co-operation and Development, it’s not nearly enough to stem the labor shortage. The number of workers older than 65 rose to 7.3 million in 2015, or 21.7 percent of the population for that age group, according to data from the statistics bureau. Japan’s worsening worker shortage also is stark: the number of workers is projected to decline to 56 million in 2030 from 64 million in 2014. This forecast by the Japan Institute for Labor Policy and Training, a government-related group, is based on conditions that the economy and the labor force participation rate won’t change. To avoid such a shortage, the country needs to come up with more innovative policies to pull seniors into the workforce. Yet Japan’s corporate structure is still stacked against widespread employment of older workers. Though some companies have introduced merit-based pay, moving away from a seniority system, age remains an important factor and the career ladder ends for many employees at 60 or before. Mandatory retirement is still in effect in many companies, though there is no official retirement age in Japan. And even recent advances won’t do much to alleviate the labor shortage as the percentage of seniors in the workforce declines markedly as they age, said Robert Feldman, chief economist at Morgan Stanley MUFG Securities Co. in Tokyo. He calculates that labor force participation in Japan for men ages 65 to 69 is 54 percent and for women it’s 32 percent — good figures compared with other major economies. Yet for men 70 and older it falls to 20.3 percent and for women in that age group plummets to 9.3 percent. “You’d need a lot more” older workers taking jobs to make a dent in the labor crunch, Feldman said. “The increase in participation rates is offset by shifting shares of population,” meaning Japan’s population is aging so rapidly that more people are leaving the labor force even as a higher percentage of seniors take jobs. The government in April 2013 changed rules to require employers to keep on all workers who want to stay until age 65. Under that system, most companies basically have workers retire at 60 and return under a “continuous employment” policy at a lower wage — often a much lower wage. This is less costly than raising the retirement age or abolishing a mandatory retirement system, the other two choices that companies have. Many of those who’ve found jobs after mandatory retirement want to keep working not only to stay active — they need the money. Japan’s government is gradually raising the age at which people become eligible for pensions to 65 from 60, leaving many with a gap. Also, pensioners on fixed incomes are more vulnerable to swings in the economy and many were hit hard by the last sales tax increase in April 2014. Sonoe Kudo, 65, who works at a nursing home in Tokyo run by Care 21, said she wants to work into her 70s as long as she’s healthy. With her living costs and a premium for nursing-care insurance, it can be tough to make ends meet on a reduced pension. “Elderly people can’t really live only by pensions,” she said. About 81 percent of Japanese companies still set the retirement age at 60. The latest survey by the labor ministry showed that only 3 percent of companies abolished their retirement system and about 16 percent raised their retirement age, while more than 80 percent opted to adopt a continuous employment system. Among employees who work at companies requiring they retire at 60, more than 80 percent were rehired or extended their employment, according to the survey. Yet that continued employment often means a big pay cut. Average annual income, including pension payments, for re-employed full-time workers in their early 60s was ¥3.8 million ($38,000) according to a survey by the Japan Institute for Labor Policy and Training. The survey showed that the average worker’s salary at age 61 was about 27 percent less than it was just before the employee turned 60. Another survey showed that average monthly wages for full-time male workers in Japan ages 60 to 64 was ¥292,000, about 30 percent lower than ¥412,000 for those ages 55 to 59, according to 2015 data from the labor ministry. One reason many Japanese companies are reluctant to keep older workers in key positions is that they’re more costly than younger workers, as seniority is still a major factor in setting salaries in Japan. Feldman says if Japanese workers’ productivity improved as they aged, companies would want to retain them rather than push them out. He also says the high percentage of companies rehiring workers at lower salaries after they turn 60 underscores another problem in Japan — the lack of workforce mobility. “Essentially, what’s happened here is that these people are not mobile enough to get another job, so they take what they can get” from their current employer, he said. Daiwa House Industry Co., Japan’s biggest home builder, has decided to come up with another system. 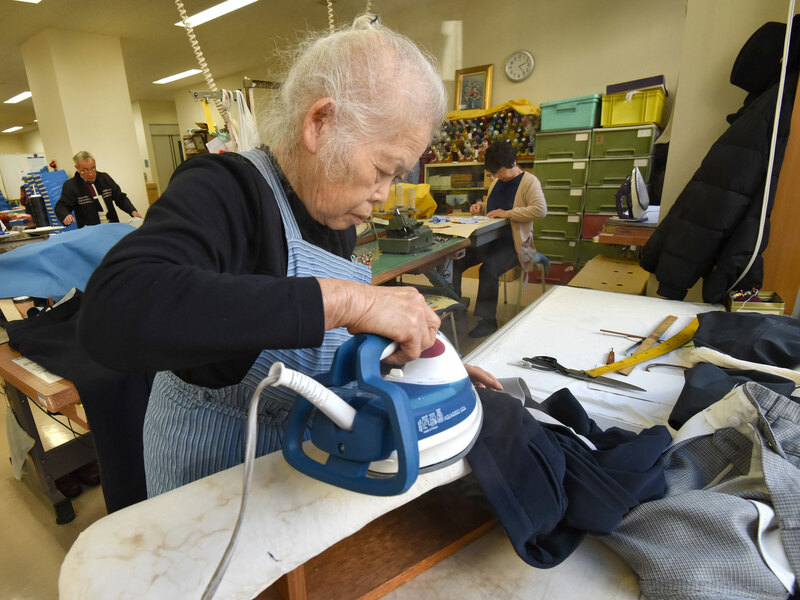 It’s one of the few Japanese companies that has raised its mandatory retirement age, to 65, and also has introduced a system making those 65 and older eligible to work as contract staff — with no age limit. It has proven popular. Care Twentyone Corp., a nursing service provider, abolished its mandatory retirement system in April 2014. The proportion of its total workforce made up by employees older than 60 has increased to 16.6 percent from 11.5 percent, according to the company. The oldest employee is an 86-year-old female home helper. Taira Yoda, 64, president of Care 21, said the company abolished mandatory retirement because it’s in an industry with a significant labor shortage, and it wants to give employees the option to earn stable income when they’re older. December 27, 2016 in Aged Care, Aged Pension, Federal Budget, Retirement, Wealth Building.